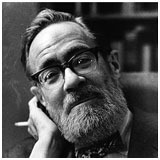 John Berryman (1936) was a Pulitzer prize-winning poet. Born in Oklahoma on October 25th 1914, John Allyn Berryman was to become one of America’s most notable and original 20th century poets. Winner of a number of prestigious awards, including a Pulitzer prize for his 77 Dream Songs in 1967, and an accomplished scholar and literary critic, he was considered a key figure in the Confessional school of poetry. A graduate of Columbia College, Berryman came to Clare as a Kellett Fellow in 1936 and in 1938 was awarded a Cambridge BA, having successfully taken the English Tripos Part II. The time he spent at Clare where, according to one observer, “he wrote poetry all the time and was known as a poet though he was not actually publishing at the time”, seems to have been one of the happier periods of his life and forms the setting of Part Two of Love & Fame, published in 1970. While a student at Cambridge, Berryman took his first trip to Ireland with the hope of meeting WB Yeats in Dublin. As it happened the two men actually met in London a few weeks later and, in his own words, John “began work in verse-making as a burning, trivial disciple of the great Irish poet William Butler Yeats”. He was later awarded a Guggenheim Fellowship, which enabled him to return to Ireland with his wife and daughter in 1966. He spent an academic year living in Dublin, where he wrote many of the poems that would form his best-known work, The Dream Songs (1969). Berryman’s life and work was haunted by the suicide of his father in 1926, when John was just twelve years old – a tragedy that he would later explore in his poetry, and sadly repeat in 1972 when he took his own life, aged 57, after a long struggle with alcoholism and depression. By the time of his death, John Berryman had become a major figure, not only in American poetry but throughout the English-speaking world. He had been a teacher and scholar at the University of Detroit, Harvard, Princeton, the Universities of Washington and Cincinnati, and, finally the University of Minnesota, where he was Professor of English for almost 20 years. He received many awards for his poetry, including a Pulitzer Prize (1967), the National Book Award and the Bollingen Prize (both 1969), and was elected a Fellow of the American Academy of Arts and Sciences (1967).